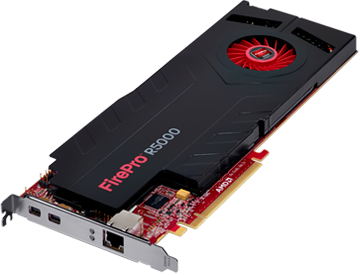 AMD FirePro™ R5000 remote graphics is AMD’s second generation PCoIP based solution for remoting multi-monitor workstation computing experiences. Its sophisticated transmission and compression capabilities enable a true PC experience with full multi-monitor 3D and video support. Delivering uncompromised quality of graphics and a user experience on par with physical desktop workstations, AMD FirePro™ R5000 is capable of remoting up to four 1920×1200 resolution displays per user (requires compatible Teradici based client device, e.g. ALTO2140). Based on Teradici’s powerful TERA2240 host processor designed to relocate Windows® or Linux®-based workstations into the datacenter and connect with a PCoIP thin/zero client remotely without impacting application performance. Sophisticated transmission and compression capabilities enable a true PC experience with full multi-monitor 3D and video support. Remote up to four displays at 1920 x 1200 resolution (requires compatible Teradici Tera2 based client device, e.g. Dell Wyse P45 zero), allowing users to multi-task with ease. Sensitive data and intellectual property stay in the datacenter – just pixels leave. Supports fully encrypted sessions, including support for NSA defined Suite B security protocols. AMD PowerTune is an intelligent system that performs real-time analysis of applications that utilize a GPU. In the event that an application is not making the most of the power available to the GPU, AMD PowerTune can improve that application’s performance by raising the GPU’s clock speed by up to 30 percent – automatically.